Hidari Okuriashiharai to Osotogari or Osotoguruma. 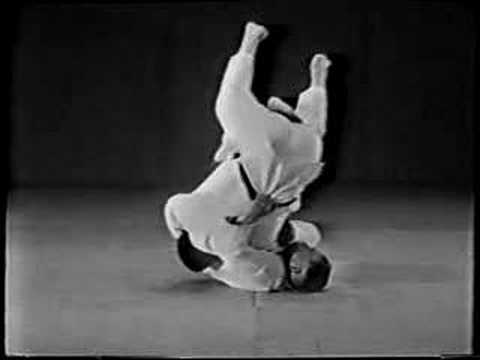 Hizaguruma to Deashiharai - used when uke resists tori's attempt at Hizaguruma by bringing up his left foot to regain his balance - tori abandons Hizaguruma and attacks uke's left foot as it is moving forward. 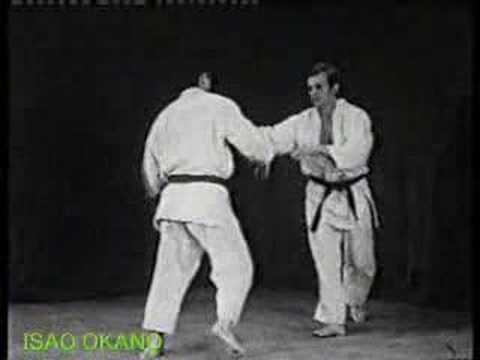 Ouchigari to Osotogari - when tori fakes the Ouchigari, he comes in to the side (his right).with knee bent and pulls forward instead of pushing back so that when opponent's balance is disturbed he can swing into Osotogari. Counter to Ippon Seoinage - Step to right side, shift weight to right leg, sit down and do Ura Nage throwing opponent over your left shoulder. 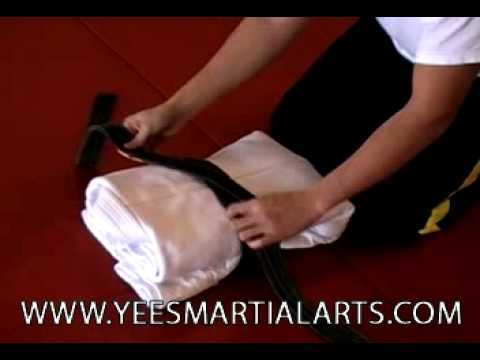 The power of this throw comes from your right leg which should be bent at the knee and right foot stays on mat. 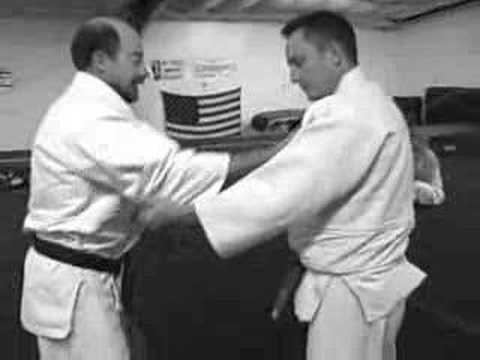 Counter to Ippon Seoinage - Step to right side, stoop down low grasp your opponent's right leg with your left hand and lift him by throwing out your stomach. 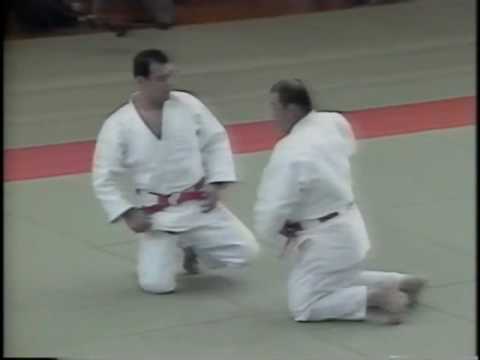 As your opponent comes in for Ippon Seoinage, pull him in close with your right arm. When you grasp his right leg with your left hand, reach in deep so that your left shoulder helps with the lift. 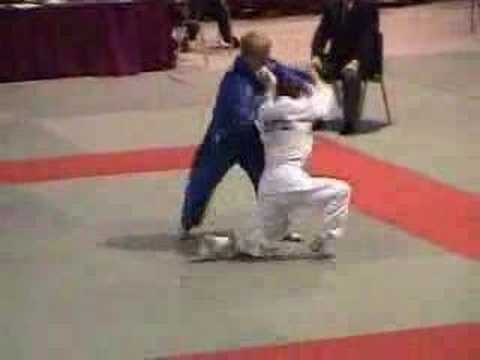 Counter to Ippon Seoinage - Put your weight to your left foot, lean left shoulder down, right arm up. Put your left arm around opponent's waist low and lift him from your stomach by throwing your pelvis out and throw him in Ura Nage over your left shoulder. 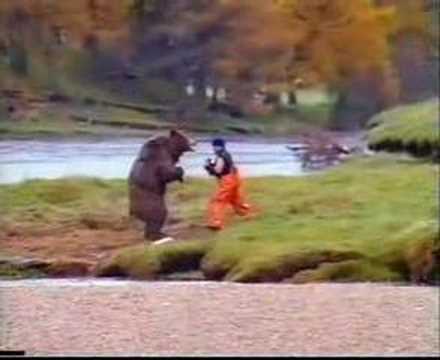 As he comes in for Ippon Seoinage, pull him in close with your right arm. Get your stomach to his side. Counter to Ippon Seoinage - Put your left hand very low and deep around opponent's waist and turn your body to the side - you can counter with Ushiro Goshi or Ura Nage. Counter to Taiotoshi - As your opponent comes in, control his right elbow with your left hand by leaning or putting your weight on it. At the same time that he comes in, skip or slide quickly to the right and pivot your hips sharply to the right. Slide or skip in a half circle close to your opponent. Defense to Hanegoshi - Hook your left leg around opponent's standing leg. Counter to Hanegoshi, etc. - As your opponent comes in, pull your right arm out to side with straight elbow and step to right and pull out with your left arm at the same time. 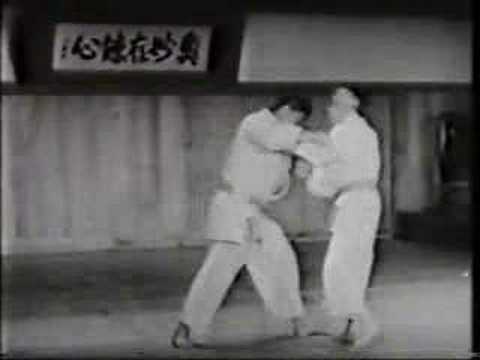 Defense to Hanegoshi - As your opponent comes in, step to right in a half circle with a pronounced hip movement. At the same time, tuck your opponent's right elbow in with your left arm in a circular movement. Put your weight to your left hand and left leg. 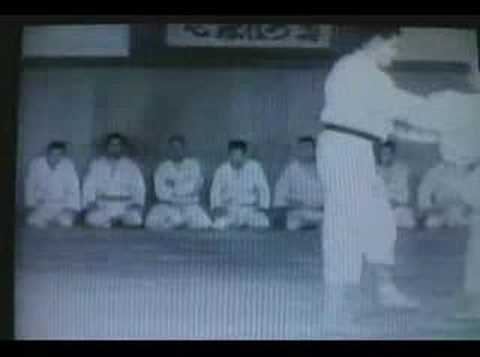 Counter to Osotogari - If your opponent attacks your right legs put your weight to your right arm and sweep your right leg across in front of your own left leg in an Okuriashiharai movement. Pull your right arm down and to the back. Counter to Osotogari - Leave your right foot in place when opponent attacks it. As he comes in, swing your left foot all the way around behind your right foot and throw opponent in Sotomakikomi. Be sure to get your hip in deep. Pull your opponent in to you as you swing your left foot back. Counter to Osotogari - When opponent attacks your right leg, slide your left foot back and pull him in close with your left arm and throw him with Osoto-gari. Defense to Osotogari - When opponent attacks your right leg, slide your right leg back and shift your weight to your left foot. As you slide your right leg back, tuck your opponent's right elbow in with your left hand in a circular movement. Defense to Goshi Waza - When your opponent comes in for any hip throw, pull his right elbow in with your left hand, put your weight to your left foot and twist your body to the right. Pull your right arm with sharp pull to your rear. Just turn your body, do not step Push your left hip hard into your opponent. Good for Hanegoshi and Tsurikomigoshi. Defense to Hizaguruma, Sasaetsurikomiashi, Haraitsurikomiashi - Step to left front and lean down on your own left arm. When performing Kouchigari, advance in with your right foot followed by your left foot. Your left foot must be behind and touching your right foot. Bring your left hand down to your left hip and lean your weight down on your left hand with body slightly bent and leaning over your left hand. Try to reach your right foot far behind your opponent's foot with a scoop or hook. Your body must bend forward from waist for good balance. Make your opponent's weight come to his right foot which is the foot you are attacking. Apply Osotogari as your opponent steps back with his left foot. Tori apply weight as he steps in for the throw. In contest Tomoenage, put your left foot outside of uke's right leg and your right foot to the side of uke's hip then throw uke over to your right side rather than over your head. This method will work in contest. Your left leg which is outside should be bent at the knee. Kuzushi is to tori's right back corner rather than over tori's head. Practice for Taiotoshi - Both uke and tori take two tsugiashi as in Nage no Kata. On third tsugiashi, tori go into position for Taiotoshi. On Hanegoshi - Make sure that the heel of your left foot is exactly in the center of your opponent's feet. The heel is in the center but the toes are turned slightly to the left and so are not exactly in the center. When you are on the bottom, slip your right hand with your thumb under across opponent's neck grasping his collar. Reach your left hand behind opponent's neck and grasp your own right sleeve with your left hand. SodeTsurikomigoshi - Tori push uke's right elbow out to outside first then up and slide in for Hidari Tsurikomigoshi. If Tori tries to push uke's elbow straight up without first pushing it to the outside, he will have trouble getting uke's arm raised. Try for Hanegoshi - come out and go into Sode Tsurikomigoshi. Now just fake the pull for Hanegoshi without trying to go in for it, then go right into Sode Tsurikomigoshi. Sanka - Put your right heel close in opponent's right arm pit - left leg slide over opponent's head and put your heel close on his neck. Kneel on top of your opponent and lock your left foot behind heel of your right foot. Lie on your opponent and grasp around his waist or legs with both your arms. Your heels must slide under his head so that they can be locked behind his head. It is not legal to squeeze with your feet, but this trick can be used for holding. Taniotoshi - Advance left foot to uke's right foot, bring up your right foot, slide left foot behind uke's right leg, keeping your foot on mat. Your kuzushi is to rear side as in Osotogari. Sit down and throw him to his right rear corner keeping your right arm across his chest. Taniotoshi as counter - Taniotoshi can be used as a counter when your opponent attempts any hip throw or Seoinage but it is important that you turn your upper body as your opponent comes in for the hip throw or shoulder toss. Then you can counter with Taniotoshi with no trouble. Tori come in same as for Osotogari but instead of doing Osotogari do Ouchigari. 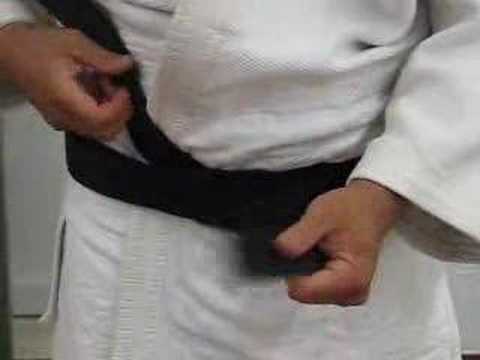 Be sure to tuck uke's elbow in stead of back and down as for Osotogari, then you will have no trouble doing Ouchigari. In using Uki Waza as a counter, be sure to take a large circular step to your right as your opponent comes in. The only difference between using Uki Waza as a counter and Taniotoshi is in the direction. For Taniotoshi you merely turn your upper body and fall to mat but in Uki Waza you must take a large circular step to your right before going to the mat. Counter to Ouchigari - When your opponent comes in for Ouchigari, sit down and throw him on Uki Waza. You must twist hips and start Uki Waza before your opponent gets his leg behind your knee for Ouchigari. Use the same Kuzushi on Ko soto gake as for Ko soto gari. Your stomach must have contact with your opponent's body in order to apply Kosotogake properly. Try Kosotogake either when your opponent steps forward with his right foot or steps backward with his left foot To get your opponent to step forward with his right foot, you must pull his right arm forward and in and at the same time attack with your left foot. When your opponent tries Kosotogake an you, turn your body to the left and counter him with Uchimata. Be sure you pivot way around, also pull your opponent close to you as he comes in. To resist Sasaetsurikomiashi or Haraitsurikomiashi, lean your body weight to your left front. On Kosotogari be sure to lift up with your right arm. Your arms should be in the same position as for Osotogari. Your left foot in same position as Deashi-harai. Difference is you lift opponent up as you reap., Your body should be in same position as Kosotogake. 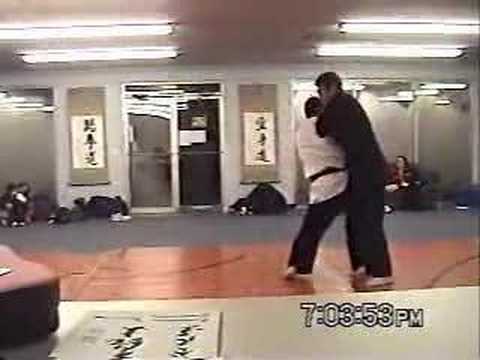 Kouchigari push straight back with arm and upper body. Be sure to reach your foot way in in for a good reap. When your opponent tries Kouchigari, turn your body to the right as he come in and pull him and counter with Sasaetsurikomiashi. On Sumiotoshi, make (as you break opponent's Kuzushi to right rear corner) sure that you push with your right hip as well as your arms. Left hand turns opponent's right elbow in and down. On Yokogake and Deashiharai, make sure you attack behind opponent's heel and not the side of his foot. On Osotoguruma, Kuzushi is straight back. Come in deeper than for Osotogari. Osotogari do not come in so deep - Kuzushi is to right back corner. On Osotoguruma, put your right leg across opponent's back of knees with your right knee bent and turned slightly to the left and toes pointed. On ushirogoshi, make sure your right elbow stays up and pull as your opponent comes in. Pull him in faster than he expected. On Haraigoshi, do not come in too deep with your hip or you cannot sweep properly. Come in a little less than Ogoshi. Choke when on bottom. Grasp opponent's left lapel with both hands. As he tries for Juiji Jime pull his head down and slide your right elbow over his head and turn your right arm so that your small finger side of arm is on his neck and apply choke. On Kosotogari make sure your right leg is between your opponent's legs and not to outside of his legs. On Kouchigari, be sure to turn your reaping foot in an exaggerated angle somewhat resembling a putting iron in golf. When your opponent tries Hizaguruma from the left, lean your weight on your left leg, bend your right knee and attack his heel which is on your knee and apply Kouchigari and push him down and back. The Kouchigari is applied to the heel of his foot which is on your knee. You can also reverse this on right Hizaguruma but it is a little more difficult. If your opponent tries Kouchigari and misses, but he is still pushing you backward and trying to take you down, sit down and apply Tomoenage. Koshiguruma cannot be done if your opponent is standing in Shizentai. He must be slightly bent forward before you can apply Koshiguruma. 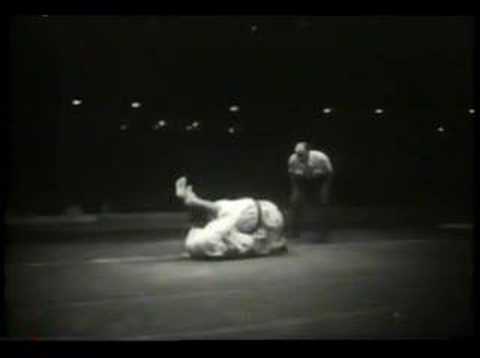 Yokowakare - when your opponent steps forward with his right leg, pull him forward and lie down (not sit down) while still pulling him and leaning back with your body as you lie down. On Taniotoshi make sure your right arm, your hip, and your leg is in straight line, elbow bent, your right side of body has contact with opponent's left side. On Haraigoshi and Hanegoshi, your left foot must be exactly in the center of your opponent's legs. Do You Know Where Your Driver Is?